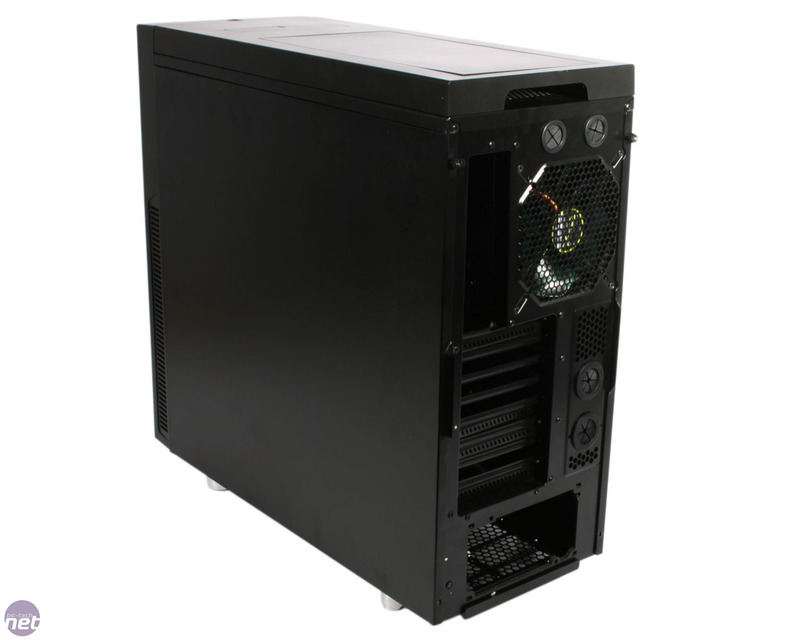 Looking at the Nanoxia Deep Silence 1 for the first time, we were instantly reminded of Fractal Design's Define R4 chassis, thanks to the 'plain black box' aesthetic. 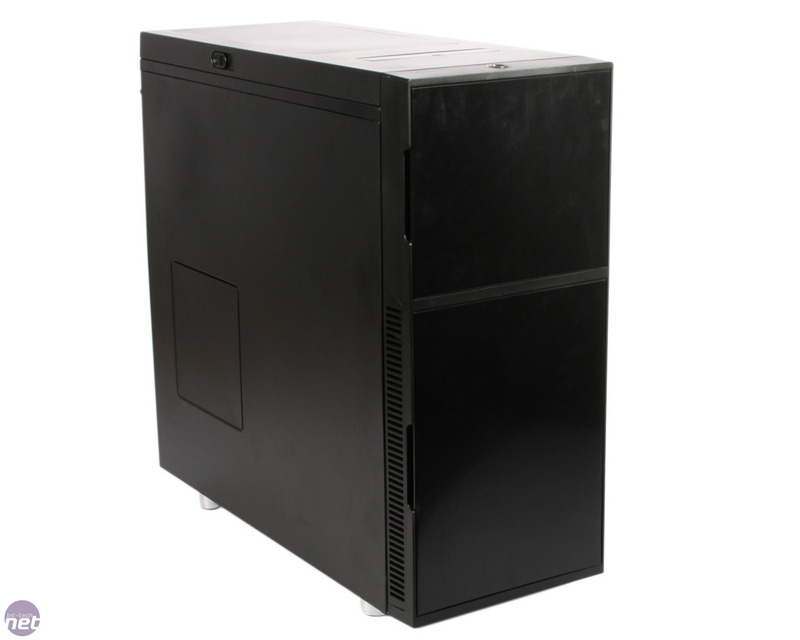 The similarity holds up upon closer inspection, because, as the name Deep Silence suggests, a quiet computing design ethos influences the case nearly everywhere you look. 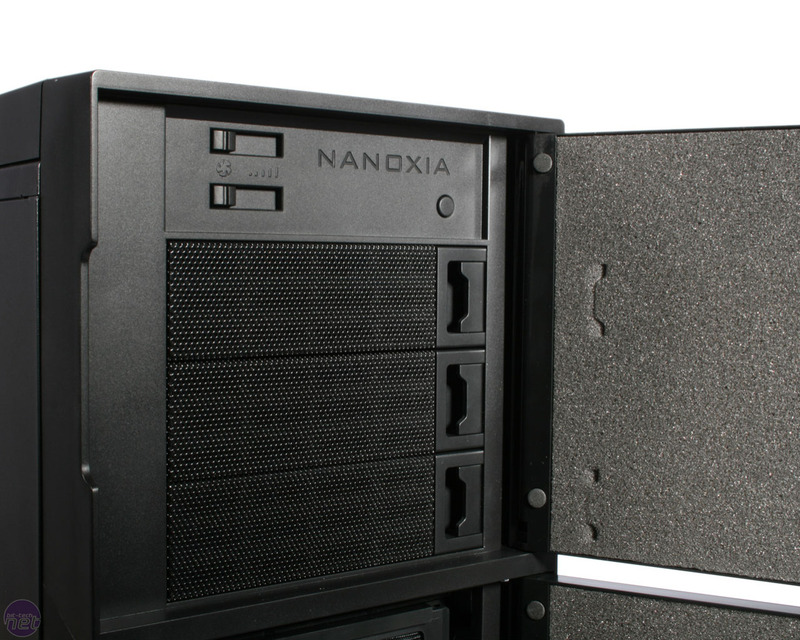 With the price difference between the two cases so small too, it's clear that Nanoxia has geared the DS1 to compete with Fractal's case, a brave move for a company new to the case market. As we moved the case around the labs for testing, another thing we quickly became aware of was its weight. Like the R4, the DS1 comes in at over 10kg. Although this is less than ideal for easy transportation, it's actually very reassuring as it makes the case feel well built. Examining the exterior reveals the plastic front and roof panels to be very securely attached, and the steel chassis itself is very sturdy and almost impossible to bend or flex in any real way. In keeping with the noise minimising principles that underpin the core design of the DS1, everything on the outside of the case is very enclosed and flat, ensuring also that the case maintains it minimalist styling. 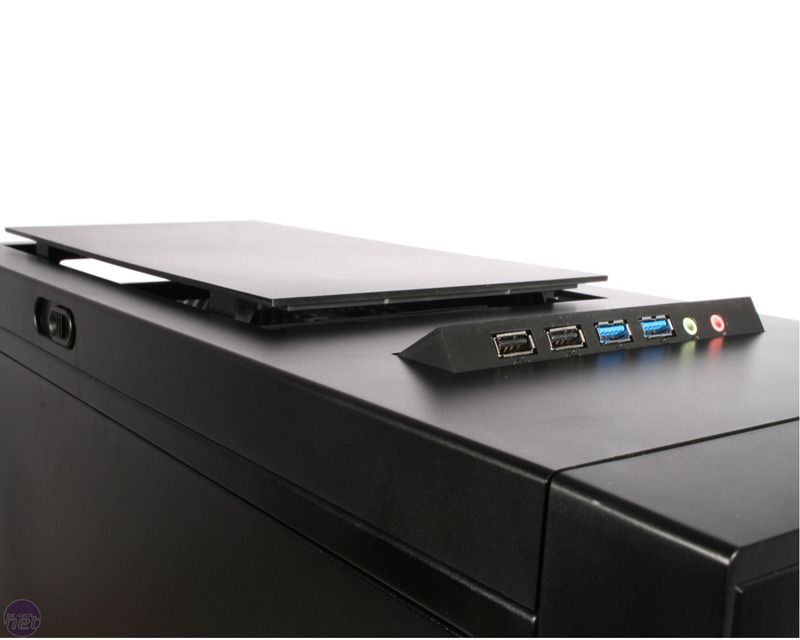 For example, the single side panel fan mount has a flat, black steel blanking plate for when it's not in use. Meanwhile, the opposite side panel is entirely flat and featureless. Moving to the roof, you'll find the two fan mounts there also covered, this time by what Nanoxia has christened the Air Chimney. A small, slightly flimsy, plastic slider on the left of the roof can be used to lift a section of the roof to allow heat from the area beneath it to escape passively, or to provide any fans you choose to install there room to exhaust air. Often such ventilation amounts to little more than a gimmick, but there is a significant amount of clearance when it's fully open. Also on the roof is the concealed push to open front panel, with a decent selection of connections. It requires more pressure than it should to open though, and we also found the power button at the front of the roof to be far too wobbly for our liking. We're fans of magnetic case doors here, so it's great to see that the DS1 comes equipped with two of them, both of which are fully lined with noise absorbing foam. The top door opens to reveal the three 5.25-inch drive bays, as well as the fan controller and reset button. Both of the fan controller's channels have their own speed sliders and can control up to three fans each. 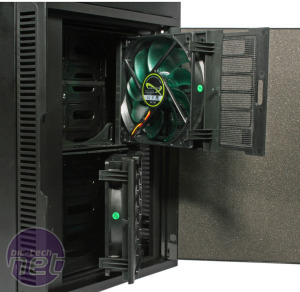 Pop open the bottom case door and you're greeted by the two front intake fan mounts. Like the 140mm rear mount, these two 120mm mounts are filled by default with Nanoxia's own Deep Silence fans, optimised for quiet operation and complete with green blades. 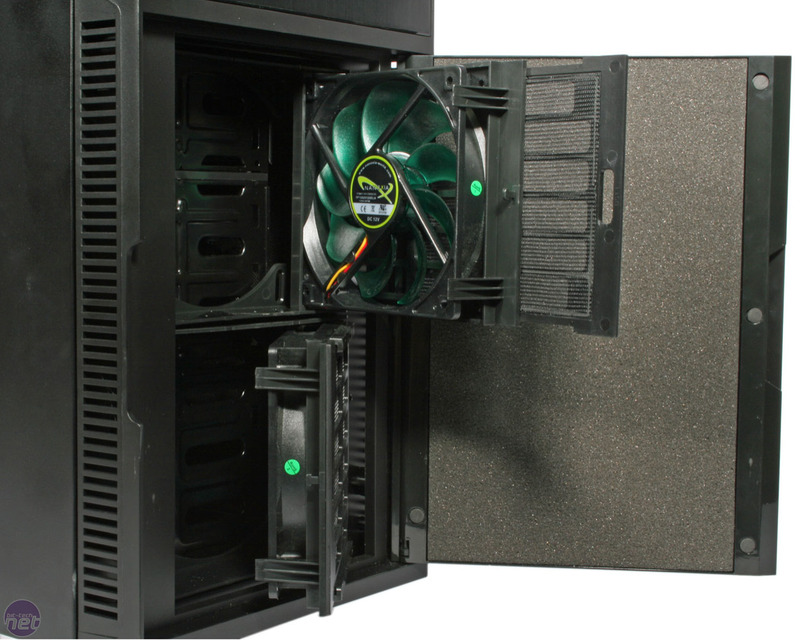 The two front fans rest in separate cages, which can be popped open from the front. This gives you access not only to the fans but also their slide out dust filters. 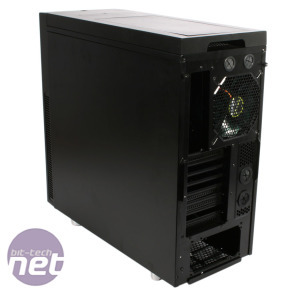 It's a great design that will make cleaning and maintenance all the easier, and a long slide out dust filter along the bottom of the case does the same. Elsewhere, the four case feet are rubber soled, as you would expect for a case focused on noise reduction, and they also give the DS1 an impressive level of clearance above your floor. 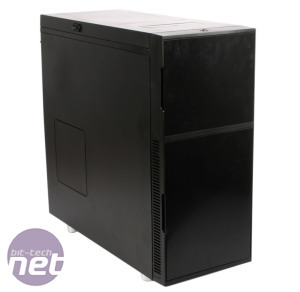 This ensures that both your PSU and any fan you choose to install in the floor mount will have easy access to cool air. 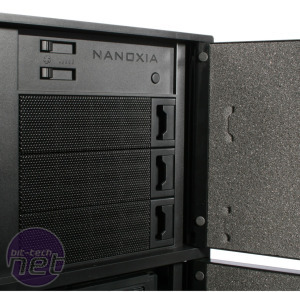 Finally, external water-cooling setups can be fed into the case via the four holes on the back, and Nanoxia even provide grommets for these that allow you to block them up completely if they're not needed, which shows excellent attention to detail.